The artworks included in the exhibition Extremely absorbent and increasingly hollow complicate the notion of a discrete body as separate from the unruly matter of the physical world and impervious to the penetration of cultural signifiers from the social world. Working across sculpture, performance, and video, artists Xandra Ibarra, Alison Kuo, and Tiffany Jaeyeon Shin forego direct representation, instead employing materials that stand in for the mass of the body and the surface of the skin to consider processes of consumption and anxieties around contamination. Both consumption and contamination occur in the body by way of ingestion and proximity––we continuously absorb elements of the world around us. These systems also extend to the social, marking bodies and populations with sometimes dangerous physical and social implications in the form of ideologies, perceptions, anxieties, and desires as examined in different ways by the artworks included. In the exhibition, Shin cultivates the growth of bacteria on the porous surface of unfired porcelain vessels, drawing connections between skin, objecthood, and agency. 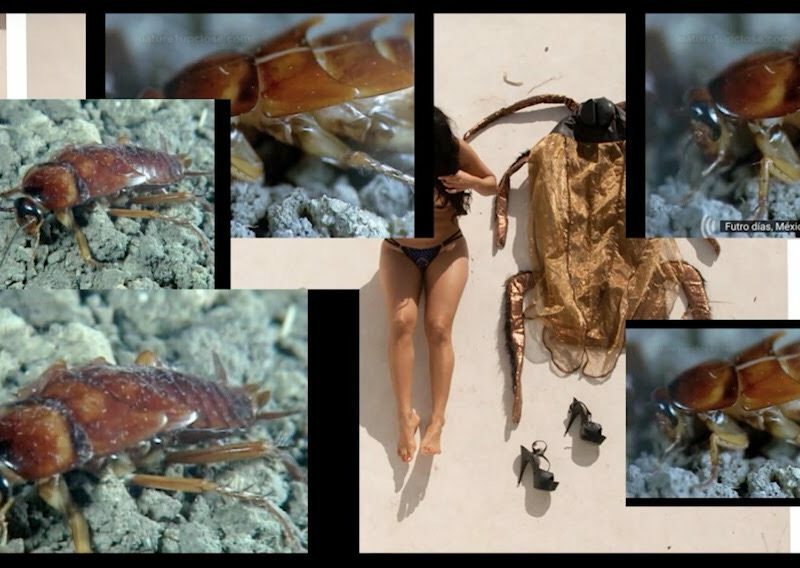 Ibarra aligns with the qualities of endurance manifested in the figure of the cockroach and its process of ecdysis, when the insect sheds and regenerates its shell in an ongoing cycle not of transformation, but of sameness. Kuo engages notions of sacrifice, sensuality, and aspiration contained in the material properties and social history of gelatin in the United States, tracking its transformation from its early use in wartime rationing to its emergence as a colorful object of desire. Across the works, the artists implement living and moving processes: the visible growth of bacteria, the contours of a cockroach skin costume enlivened and rendered void by a vacuum, the vigorous contact between flesh and gelatin. The works privilege viscous, slippery, and transitional states over the solid and static. They implement materials often deemed disagreeable and impure over clean and controlled to examine how value is perceived and assigned. Through their materials, the artists evoke modes of hollowness, absorbency, void, and excess, registering the potentials and dangers of these interrelated – and sometimes conflicting – conditions. Ibarra’s work has been featured at El Museo de Arte Contemporañeo (Bogotá, Colombia), Broad Museum (LA, USA), Popa Gallery (Buenos Aires, Argentina), Joe’s Pub (NYC), PPOW Gallery (NYC), Anderson Collection (Stanford) and Yerba Buena Center for the Arts (SF) to name a few. Recent residencies include Marble House Project, Fort Mason Center for Arts and Culture, National Performance Network, and the Atlantic Center for the Arts. She has been awarded the Queer Art Prize for Recent Work, Art Matters Grant, NALAC Fund for the Arts, ReGen Artist Fund, and the Franklin Furnace Performance and Variable Media Award. Her work has been featured in Artforum, Paper Magazine, Hyperallergic, Huffington Post, ArtNews and in various academic journals nationally and internationally. She is currently curating a year long performance art series at The Broad Museum (LA) with Nao Bustamante entitled EN CUATRO PATAS. Cuchifritos Gallery + Project Space, a program of Artists Alliance Inc, was founded in 2001 to foster a deeper connection between contemporary art and the local community, to provide an alternative space within the Essex Street Market to showcase emerging artists and emerging ideas, and to serve as a platform for curators to challenge dominant exhibition models. Abrons Arts Center’s AIRspace Residency is made possible through the generosity of the Jacques and Natasha Gelman Foundation, the New York City Department of Cultural Affairs, and the Milton and Sally Avery Arts Foundation. Image: Xandra Ibarra, En Proceso, 2016, Video. Courtesy of the artist.